It’s surprising that I even ended up here in the first place because I found it originally on accident like Christopher Colombus minus the biological warfare and genocide of the local population. It was a lovely summer day with my friend who I went out with to get ice cream at Fell and Cole. 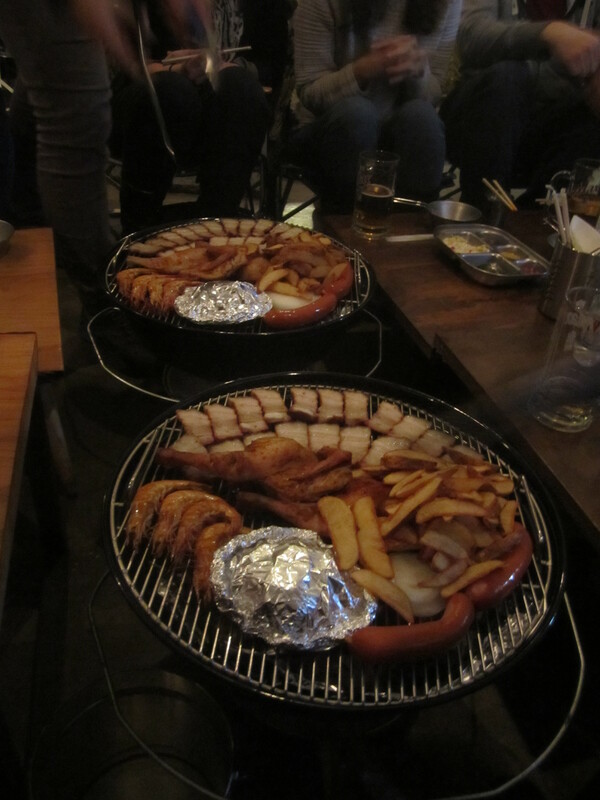 We then walked around Hongdae just for fun, and we stumbled upon the establishment that drew us in with the grills set up outside. 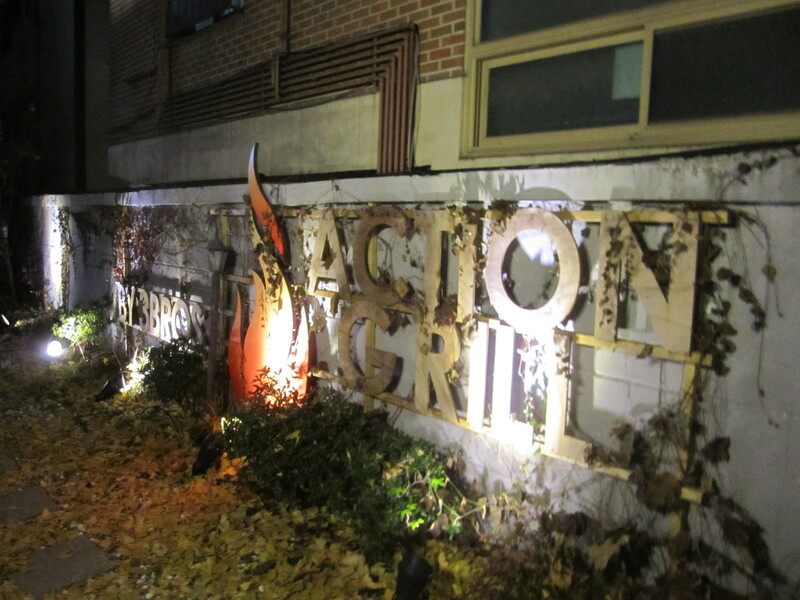 We took a look inside, and I knew that I absolutely had to eat at Action Grill one day. What better day than my birthday? 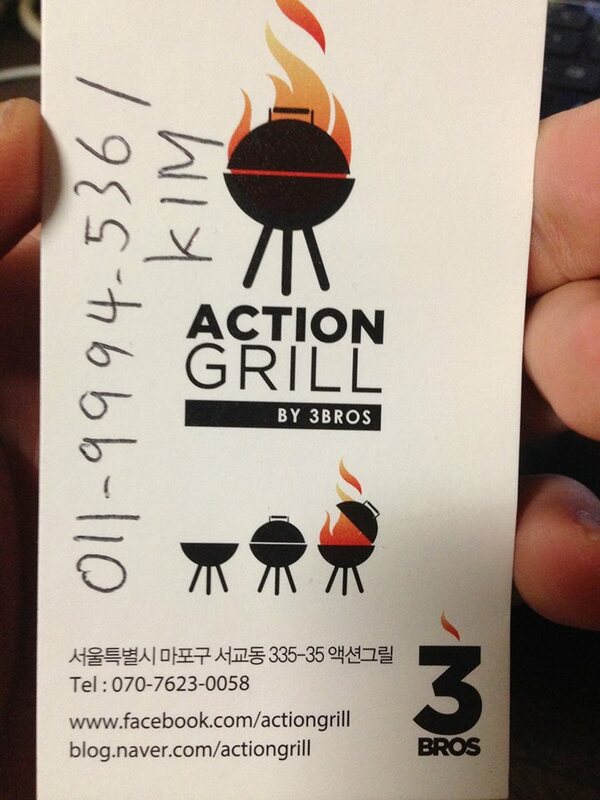 So I set everything up with the owner, Kim, whose number is on the card. He was very helpful and understanding, so I’d give the service an A+ just based on his accommodating nature. Now you might be wondering what sets Action Grill apart from other restaurants and made me want to eat there above all other places? 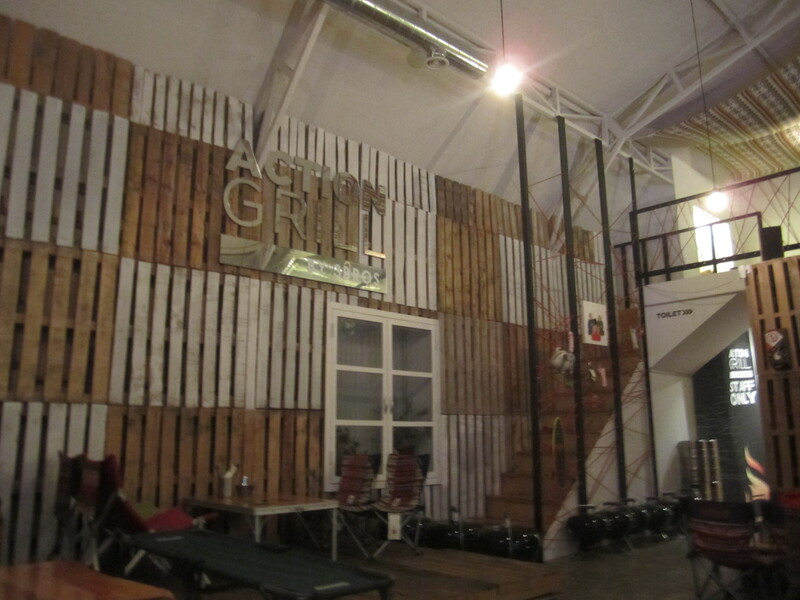 Well, at Action Grill you camp indoors while you eat. 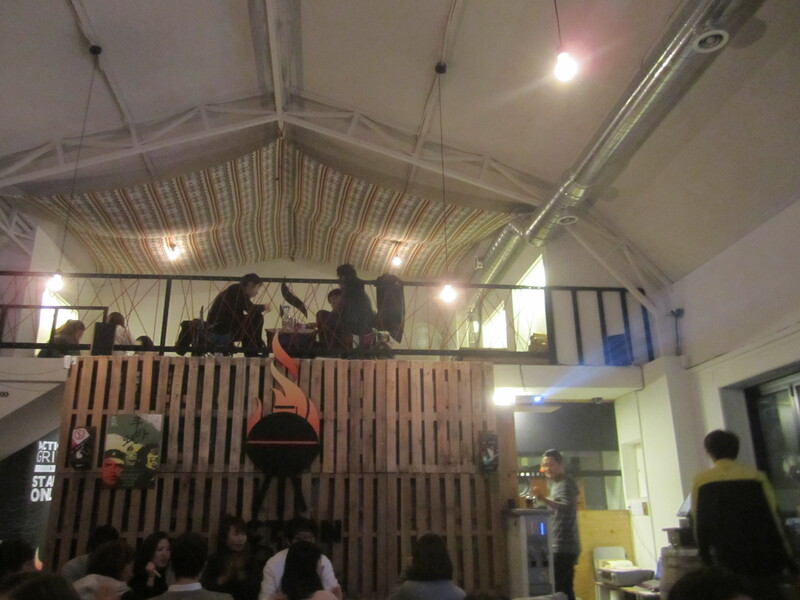 So basically everything from the seats to the grills, to the decor are straight out of a foray in the forest. 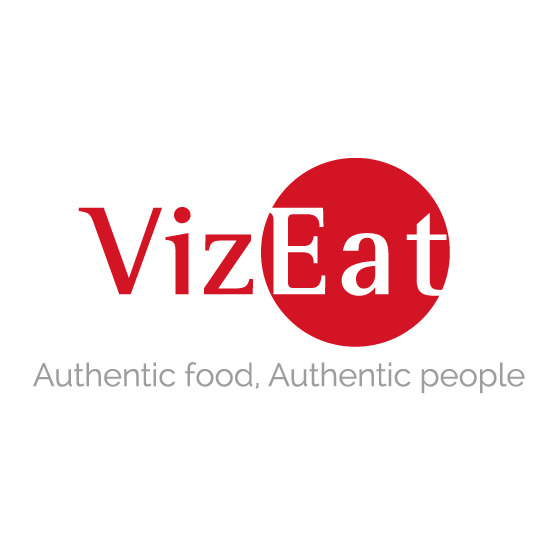 Their menu revolves around grill sets which range from 15,000 W to 40,000 W. They also have a wide range of beverages both alcoholic and non-alcoholic. For our group of 12 people, we got three of the “Brother” sets which feeds four people, more or less. It took about 15 minutes for them to prepare it, and then they brought it out to our tables in full Weber grills. When they removed the tops, I was taken aback by how much delicious food was piled up in front of me. 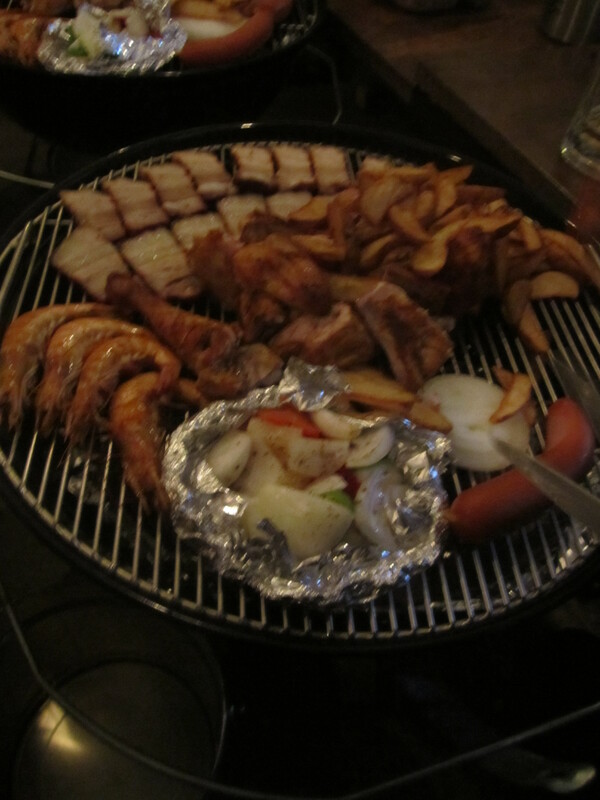 On one grill we had slices of bacon, sausages, full shrimp, chicken, potato wedges, and veggies encased in a tin foil tent. It was a fun group eating experience since you had fold out forks and filled up each others’ small camping bowls with the food. As for the actual meal, all of the food was great. I was especially partial to the bacon because there was a lot of fat on it which made it especially smooth and buttery tasting. The chicken was good but oddly had an aftertaste of hot dogs. I personally liked combining the onion and pepper veggie salad with the different meats to provide a crisp contrast to the savory elements that the meats brought. As for the potato wedges, they were well made with crunchy exteriors along with firm, snow-white interiors. It was an even more interesting dining experience since I was interviewed and filmed by Korean college students talking about how I much I enjoyed the restaurant. Overall, I was quite satisfied with my meal at Action Grill and the unique camping experience was quite entertaining since they took away all of the annoying parts of camping like mosquitos and rabid raccoons. However, my birthday food adventure didn’t just stop there. 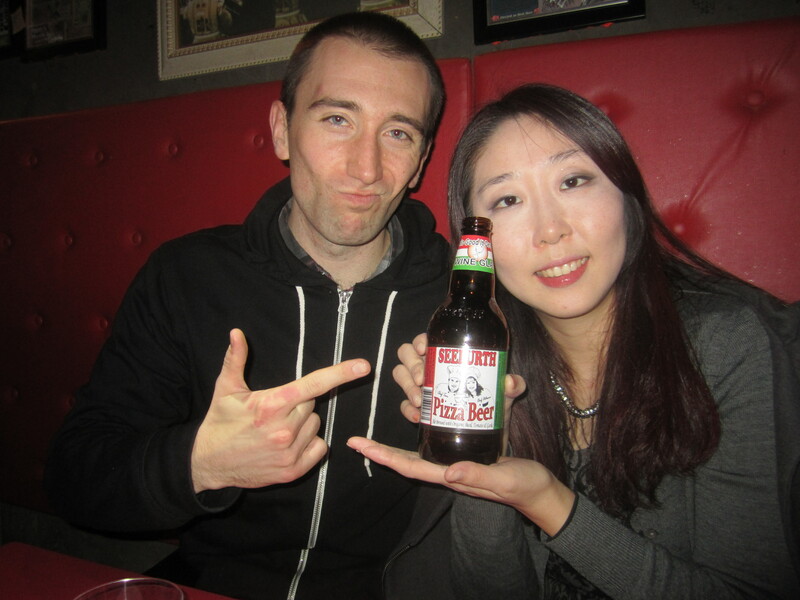 I also tried some pizza beer with my friend, Bora. Somehow Tom Seefurth managed to distill the essence of a classic Margherita pizza into a lager. It wasn’t something that I would ask for again, but the experience was worth it. It had a distinct oregano smell, but as for the taste, it was more peppery and cheesy. This was an occasion where I think they over-elaborated on culinary fusion. Nothing’s better than pizza and beer, but when they combined them, it left me feeling less than saucy. Much later in the night after a lot of dancing and the occasional imbibing of some adult beverages, my friends and I stopped for some Korean street food. 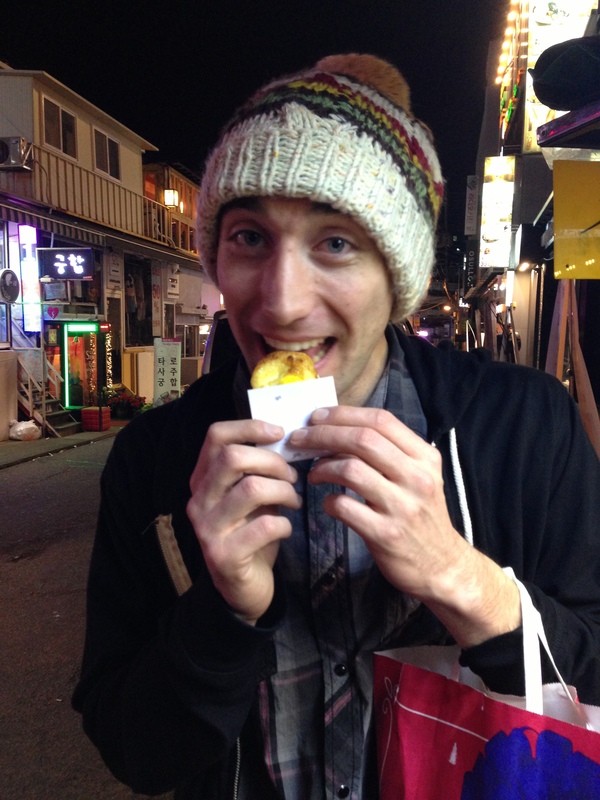 This time I tried a Korean winter specialty, 계란 빵 or egg bread. It’s exactly what it sounds like. Creative name, huh? 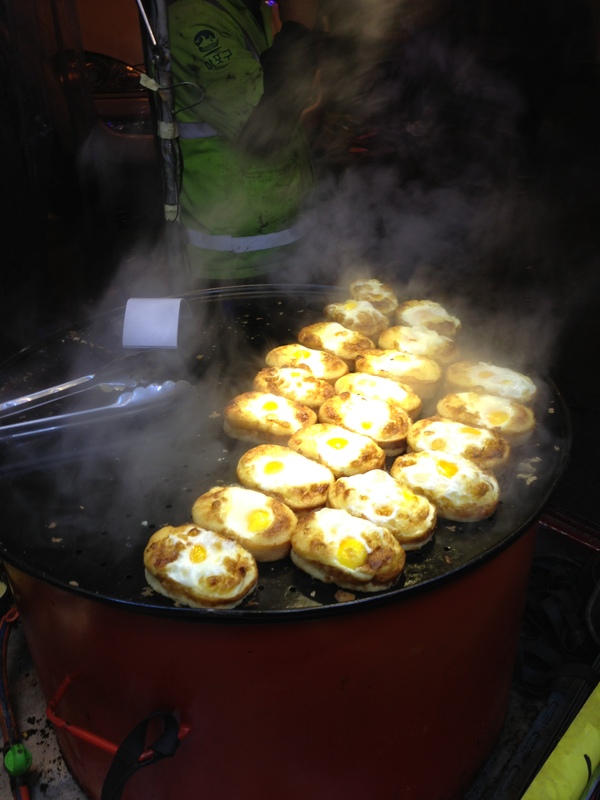 They look like small hors d’oeurves served up on a hot griddle, but they were just what I needed to brace myself against the chilly night. The egg is served sunny side up on top of the bread, so watch out for some yolk splatter. As for the bread, it was pleasantly crispy and completed this small, hearty breakfast tablet that I ate in the middle of the street. A tasty end to my birthday even though half of it ended up on my face thanks to Bora trying to feed me it.